Musser, F. R.*1, G. M. Lorenz2, S. D. Stewart3 and A. L. Catchot, Jr1. Abstract: Survey-based soybean insect losses provide a glimpse of current soybean management practices and allow one to see evolving trends. This survey was initiated in MS in 2004, and in Tennessee in 2008. This year is the first year that Arkansas has conducted the survey. The 2009 survey shows stink bugs were the primary pest in all three states, but were less widespread than in 2008. Corn earworm pressure was much higher in 2009 than in previous years. Insect scouting and the adoption of seed treatments continued to increase in 2009. Soybean losses have been compiled annually since 2004 in Mississippi (Musser and Catchot 2008) and since 2008 in Tennessee (Musser et al. 2009), providing an annual record of insect pressure and management decisions. Arkansas joined the list of participating states in 2009. These estimates are based on surveys of consultants and extension personnel, similar to those used to estimate insect losses in cotton (Williams 2006). 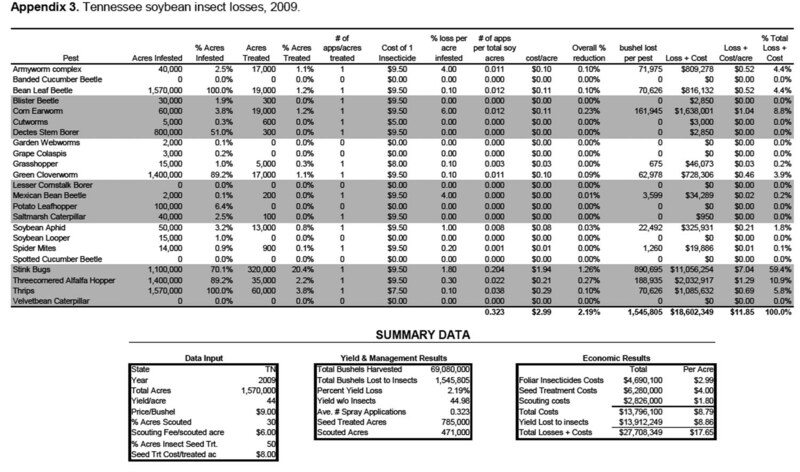 While the costs and losses estimated for a pest in any given year are somewhat subjective, these losses provide an historical record of pest pressure and management practices and provide an estimate of the economic impact of the various soybean pests. A telephone or written survey was conducted with numerous crop consultants and extension personnel in the fall of 2009. Surveyed people were those who actively scouted soybean fields and those who assisted growers in making soybean pest management decisions. These surveys were compiled and then combined with our own experience to estimate the various fields in the table. Acreage, yield, and price data were drawn from Agricultural Statistics Service publications (USDA NASS). The estimates were placed in an Excel spreadsheet (Microsoft Office 2003, Microsoft Corp.) to make the various calculations. The actual formulas used in the spreadsheet were published by Musser and Catchot (2008). The trends toward increased acreage and increased soybean management in Mississippi continued in 2009 (Table 1). Planted acreage, scouted acreage, and the use of seed treatments were all higher in 2009 than in any year since this survey began. Tennessee also experienced an increase in scouted acreage (20% to 30%) and the use of seed treatments (40% to 50%) from 2008 to 2009. Arkansas scouted acreage (65%) was intermediate between Mississippi and Tennessee. Percent yield loss in 2009 to all insects in Mississippi was the lowest during the six years of the survey, indicating that increased management is providing some benefit. In spite of reduced insect losses, total loss plus cost due to insects was similar in 2009 to the previous two years, at least partially a result of higher prices for soybeans during these years. Table 1. Mississippi average soybean management and performance, 2004–2009. Table 2 compares the use of foliar insecticides to minimize losses from the major pests in 2009 and in previous surveys. Stink bugs (Hemiptera: Pentatomidae) were consistently the primary target of insecticide applications in all states in every year surveyed. More insecticide applications were made to control stink bugs in 2009 than applied on average over the previous five years, but less than in 2008 (Musser et al. 2009). While not listed separately in the survey, the redbanded stink bug (Piezodorus guildinii) comprised a much larger proportion of the stink bug complex in 2009 than in previous years, especially in the southern delta region of Mississippi where it sometimes was the majority stink bug species. This was the primary cause for the increased number of applications for stink bugs on acres that were treated in Mississippi compared to previous years. Overall, corn earworm, Helicoverpa zea, (Noctuidae, Lepidoptera) was the second most often targeted insect for insecticides in 2009, which was a substantial increase over previous surveys. 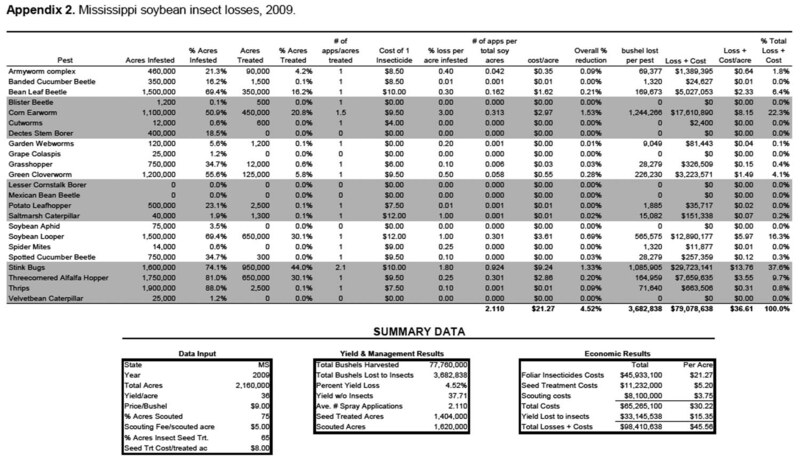 The ranks in losses plus costs (Table 3) mirror the number of insecticide applications (Table 2) with stink bugs causing the most losses overall in 2009 followed by corn earworm, threecornered alfalfa hopper and soybean looper. Beyond the species listed in Tables 2 and 3, yield losses and insecticide applications were relatively rare for all other pests in all states (Appendices 2-4). Table 2. Foliar insecticide use (No. applications per soybean acre) on major soybean pests during in Mississippi, Tennessee and Arkansas. Table 3. 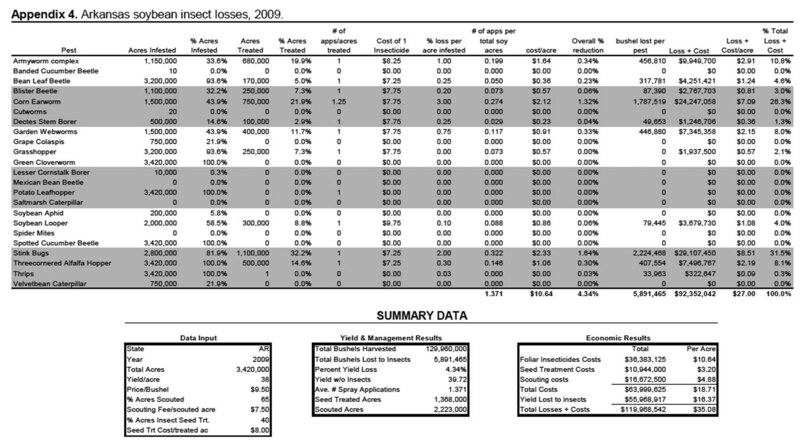 Estimated losses plus management costs ($/ac) due to insect pests in Mississippi, Tennessee, and Arkansas. Musser, F. R., and A. Catchot. 2008. Mississippi soybean insect losses. Midsouth Entomol. 1: 29-36. Musser, F. R., S. D. Stewart, and A. L. Catchot, Jr. 2009. 2008 soybean insect losses for Mississippi and Tennessee. Midsouth Entomol. 2: 42-46. USDA NASS. NASS Data and Statistics. United States Department of Agriculture National Agricultural Statistics Service, http://www.nass.usda.gov/Data_and_Statistics/Quick_Stats/index.asp. Accessed November 17, 2009. Williams, M. R. 2006. Cotton insect losses. National Cotton Foundation, http://www.msstate.edu/Entomology/Cotton.html. Appendix 1. 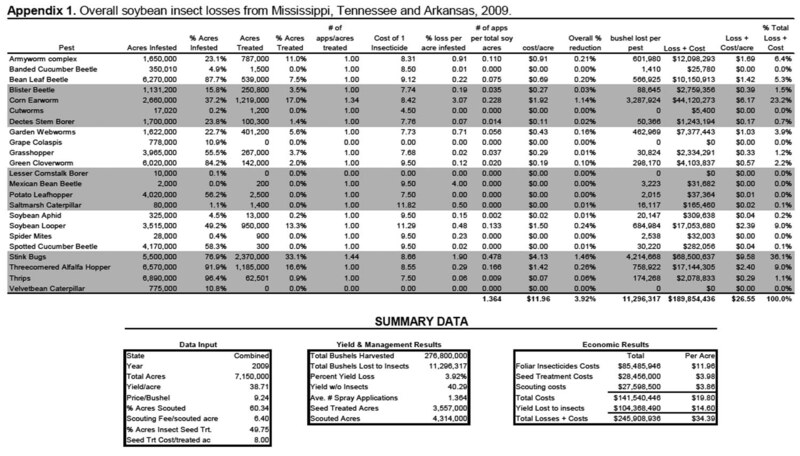 Overall soybean insect losses from Mississippi, Tennessee and Arkansas, 2009. Appendix 2. Mississippi soybean insect losses, 2009. Appendix 3. Tennessee soybean insect losses, 2009. Appendix 4. Arkansas soybean insect losses, 2009.